Well, a week before the official arrival of the Realme 2 Pro, the device leaks on Geekbench. 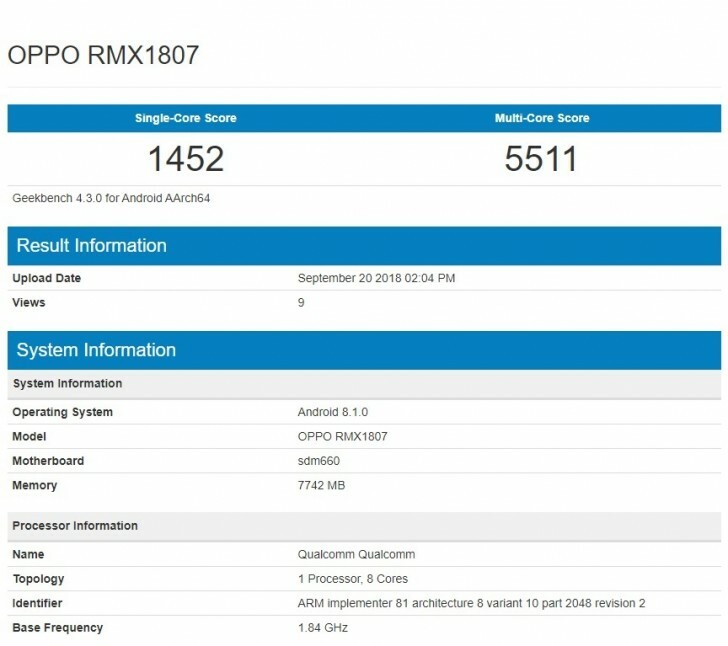 The smartphone was teased by the CEO of the company recently which was scheduled to come with Snapdragon 660 SoC but now the listing revealed that the handset will be sporting 8GB of RAM and the device has been codenamed as OPPO RMX1807. The Oppo R11, R11s and R15 had the same chipsets and the benchmark scores of these handsets are also in line. According to the listing, the device has the single-core score of 1452 while the multi-core score has been noted as 5511. Moreover, the device will be running Android 8.1 Operating system out of the box and will come with the companies own Colour OS 5.1 on top. The handset will come with 128GB of storage along with extendable storage option and 8GB of RAM. Not many specs have revealed yet but the listing shows an octa-core processor from Qualcomm. A recent official teaser of this handset has revealed a water-from notch on the top along with a glass sandwich design giving it a premium look. The handset is expected to be priced aggressively and will be competing in the mid-range segment which is mostly occupied by Xiaomi’s Redmi devices. The device is expected to sport the dual rear camera set up along with the selfie camera. Oppo has already seen a good response in the market for it Realme smartphone and is expected to repeat the same with its upcoming handset also which is going to be revealed on 27th of September. Are you excited to see this device? It should be a dream phone for all the gamers with 8GB of RAM and 128GB of RAM. Do you own any Oppo device? Comment in the section below and stay tuned to Android Advices for more news and updates.